One Direction strip down to their underwear in part to promote their upcoming MTV VMA appearance, and also because they are so hot! They needed to cool down. To celebrate getting nominated for their two MTV VMAs, the lads agreed to front their own 30 minute show, which will centre around the most memorable VMA moments and performances of all times. 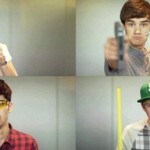 Check out their special video clip aired on MTV below.